South Korea and the United States have agreed to suspend their joint military drill slated for August, Seoul’s Defense Ministry said Tuesday, following US President Donald Trump’s pledge to end “war games” with South Korea after his summit with North Korea’s leader Kim Jong-un last week. In a text message sent to reporters, the Ministry of National Defense said the allies forces have decided to suspend "all plans" for the upcoming computer-simulated Freedom Guardian exercise. Describing the suspended exercise as “defensive in nature,” the ministry added that there is no decisions yet regarding other joint exercises that follow the Freedom Guardian. The ministry did not specify what “other exercises” would be. “The South Korean and the US defense ministries would maintain close coordination to make sure there is no daylight in the combined forces’ readiness posture,” the ministry said. The decision came a week after Trump’s remark that he would end “provocative war games” with South Korea after his summit with Kim in Singapore. The announcement took South Korea by surprise, leaving it with a task to figure out Trump’s exact intention. 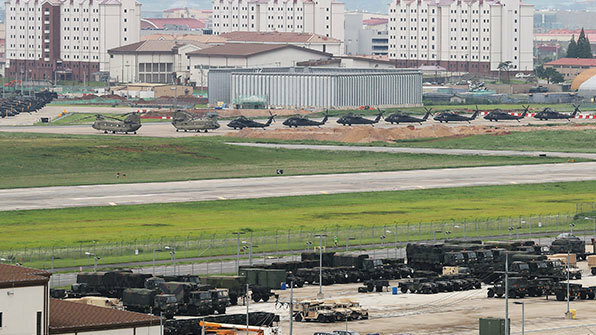 Suspension of the joint military exercise is often viewed as a way to assuage North Korea’s concern over its regime security in return for abandoning nukes. North Korea has accused the joint drill as being a dress rehearsal for invasion even as the allies’ insisted that it was defensive in nature. Involving tens of thousands of troops from the US and South Korea, the Freedom Guardian exercise includes computer simulations carried out in a large bunker south of Seoul, intended to check the allies’ readiness to repel aggression by North Korea.